Trend Lab’s Serena Nursing Cover provides the ability to nurse discreetly while remaining fashionable. 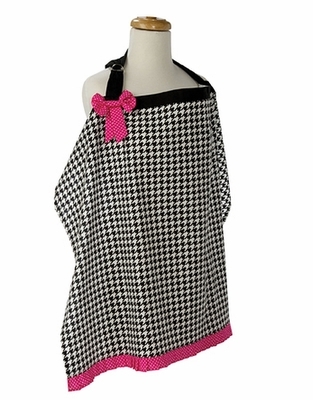 This cotton cover features a fashionable black and white oversized hounds tooth print body with a black trim and strap. A fuchsia pink and white mini dot ruffle and bow add the finishing touches! Cover features an adjustable neck strap with D ring for a comfortable fit. Collar can be positioned to view baby while nursing. Measures 24 in x 34 in. One size fits most. Coordinates with the Serena collection by Trend Lab.